You can usually find this just by searching for webmaster tools in Google or go to the Webmaster Tools page directly. Doing so opens several resources that webmasters can use to augment the way Google indexes data from their content. Click Rich Snippets Testing Tool. 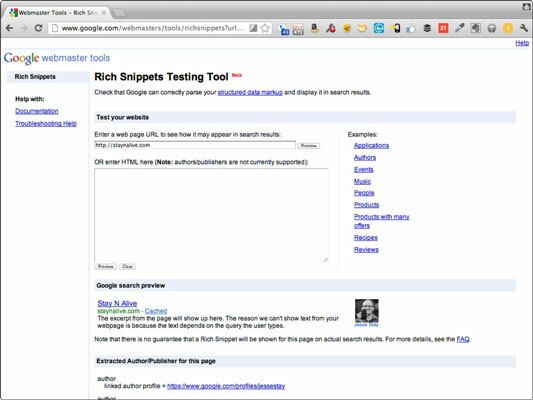 The Rich Snippets Testing Tool appears. Using the Rich Snippets Testing Tool, specify the data you want to see. You can either enter the URL of your content, or you can copy and paste your HTML directly into the boxes provided. Verify that the publisher has been linked through your Google+ Page Badge or the appropriate markup and that Google has verified that the publisher is linked. Check out what title, description, and image Google is detecting for each URL (you want these identifiers to appear onscreen appropriately on Google+). When all looks fine, and you’re happy with the preview of how the data looks in your Google search results, you should be all set. Google, as it indexes this data, should start reading your microdata appropriately and rendering your content in a way that gives your website authority and makes your postings stand out in Google.com search results. Google understands Facebook’s open-standard Open Graph Protocol when using microdata to structure content. The Rich Snippet Tool may not identify all this data, but it’s worth testing out with Google+ if you’ve already integrated this type of syntax into your HTML for integration with Facebook. SEO is another whole complex topic in itself, but clearly, Google+ and social networks can benefit any marketer’s campaign by driving traffic and sales to a web property. Search is a big part of that approach; Google+ can give your search strategy a major boost. Your SEO specialist or consultant can use the benefits of Google+ as a starting point for further structuring your content for better search gains. As you start reaping the rewards of improving your presence on Google+ search, consult an SEO expert to get the whole picture on how to take optimization to the next level. What exactly is microdata, you ask? Microdata is a set of standard supplementary attributes that you can add to the HTML tags on your website to identify the content within. They make up a set of standard attributes that Google and many other websites all understand. For example, the “rel” attribute helps identify how items of content are linked together and the types of relationships they have. Other microsyntax formats identify profile information, titles, descriptions, and the main images that show up when your content is shared. It’s always a good idea to make sure your developers are properly adding microdata to your website so that it’s shared most effectively, and is easily identifiable by sites such as Google. To find out more about the microdata that Google supports, see Google’s support page.